If you come to this post expecting a breakdown of some trend in cleantech transit, you will have to kindly wait until next week. Tonight’s post is fully dedicated to a New York City transit center’s incompetence that this blogger witnessed first hand just a few short hours ago. 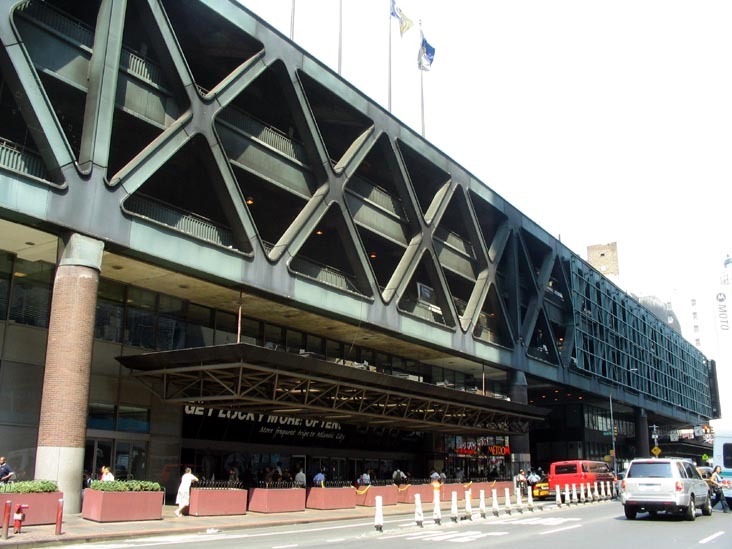 For thousands of travelers each day, for both commuters and tourists alike, the New York City Port Authority Bus Terminal serves as a portal to the “city that never sleeps.” By all accounts, this is one of the most bustling public transit hubs in the United States, as it serves over 58 million passengers annually. Simply stepping into the main terminal’s entrance on 8th Ave between 41st and 42nd streets, one wonders how this labyrinth even functions to serve it’s purpose of transporting passengers on buses throughout the Northeast. The answer is barely. For instance, just today, I had to wait 25 minutes from the time our bus returned to Port Authority until the time we alighted from the bus due to a last second gate logistic switch. In talking to other friends, apparently this type of experience is the norm, not the exception unfortunately. It is no secret that buses are treated as second class citizens in New York City. Simply look to the lack of bus rapid transit lanes, a strategy that has shown time and again to work in South America and Europe. City planners and policy makers have always favored subways or commuter rail lines over bus transit. Nowhere is this more evident than in the comparison between Grand Central Station and the Port Authority Bus Terminal. One is a beacon of architectural reclamation and commercial triumph, the other is a seventh rate architectural structure whose only commercial highlight is that it contains a Heartland Brewery (brewery should be used loosely……) by one of the main entrances. Such an important transportation hub should be seen as an architectural landmark. Other nations seem to understand this, even China. Apparently, we in the US, especially in New York, missed the memo. If the exterior architecture weren’t bad enough, perhaps one should take a closer look at the circuitous paths leading up to the actual bus gates. It is time for a Grand Central-esque overhaul. And while they are at it, why not let the revised structure rise to the sky with gleaming commercial office space like some of these 2008 proposals. I understand this is a massive capital investment that will probably bankrupt the city and state even further. The city and state probably don’t have a cool $10 billion just lying around these days. We must continue to put relevant infrastructure in place that will finally elevate the bus to its proper place alongside trains in the perception of the city public transit user. The buses in Philadelphia pass across Broad Street flashing route numbers and the ubiquitous “GO PHILLIES!” but the Philadelphia Inquirer reports that a strike by the transit workers may be impending. The Transport Workers Local Union 234 – which represents the bus drivers, subway and trolley operators and mechanics – voted to strike as early as the end of the week. The workers, who have been without a contract since the spring are prepared to strike just as the World Series, featuring the Philadelphia Phillies and the New York Yankees, would begin. It would be ironic for the buses to stop flashing their cheerleading signs just as the team they support would most need the fans who ride the buses. Management has proposed a zero wage increase for the first two years of a new four-year contract, with 2 percent increases each in the final two years. It also wants to increase contributions to health coverage from 1 percent to 4 percent; and to freeze the level of pension benefits to members. The union wants a wage increase of 4 percent each year, and an increase in pension contributions from $75 to $100 for every year of service. I am no expert on collective bargaining or SEPTA’s finances, but I hope this comes to a peaceful resolution for the residents of Philadelphia who depend on their public transportation system. My personal opinion is limited to the fact that transit workers generally are compensated rather well for a job that by-and-large requires no real skills to apply for. This is not true for mechanics and sheet metal workers, but drivers and operators are usually trained on the job. Every worker deserves a living wage, but those workers also must honestly assess the finances of the businesses they work for. Of course, as the Transport Politic has illustrated so well, if they strike, this will not be the first time SEPTA workers have done so. In fact, they have done so in 1944, 1998 and as recently as 2005. So I trust the good citizens of the city of brotherly love will cope should they need to. SEPTA is not the only transit organization with worker issues, as VIA Rail in Canada is also engaging in contract talks with its unionized workers. The passion of new MTA chaiman Jay Walder in New York is infectious. I also admit that I have a bit of transit nerd man crush on his use of subway token cuff links. However, his idea for price restructuring on New York City public transit leaves me a little baffled. It may just be that the New York Times did an insufficient job explaining the benefits of the policy. The goal would be to encourage use of buses and subways during traditionally quieter hours. And it would bring New York’s subway system in line with local commuter rails, which charge a range of fares. The chairman ruled out charging higher prices for longer trips, a system used in cities like Washington and London, saying such a move in New York “would be a mistake.” But he said a frank discussion of changes to the pricing structure “will be an important part of what we’re doing.” A transit spokesman said later that Mr. Walder was not considering higher peak fares. I understand the desire to have more people riding at non-peak hours in order to make the system run as efficiently as possible. This is especially true in New York City subways which almost never shut down. However, I do not follow the logic of reducing prices so people ride more. In New York there are two types of people who travel at night and weekends, permanent residents and tourists/visitors. The commuters, who constitute a huge number of MTA’s ridership are avoiding the MTA on nights and weekends if possible. For the residents and tourists/visitors to ride at night or on weekends requires someplace to go, which is the expensive part in New York, not the subway ride. Once traveling, though, the only other real option is a taxi and the regardless of the price of an MTA fair, it will almost surely be cheaper than a New York City cab fare which is $2.50 just for getting in the cab. City residents on the other hand probably own monthly passes which means each additional ride they take, regardless of when they take it, is essentially free. If anything, it would make more sense to tax certain hours of travel, say 8am-10am and 4pm-7pm to encourage people to take the subway and bus at off peak hours, hence increasing demand the and helping to reduce congestion during rush hours. However, I like the fact that a transit administrator is excited about transit and trying with innovation to get more people to use it at all times. Perhaps I am missing something logical and important here. If one of my readers recognizes it, please inform me and other readers with a comment. The National Transportation Safety Board can account to the fact that public transportation is not perfectly safe. There are occasionally tragic fatalities as the result of accidents on subways, trolleys and buses. However, when compared to the number of fatalities on America’s roads, public transit appears to wrap passengers in bubble wrap. For a culture that is obsessed with safety, it is unfortunate that public transportation discussions do not more frequently cover safety. Our reliance on roads as the primary means of transportation led to 37,261 fatalities in 2008, not to mention however many countless thousands of other injuries were sustained to both person and property. There have been 419,321 auto-related fatalities over the past decade. That is like killing off all of Miami, Oakland or Cleveland over the course of a decade. Keep in mind that people are generally more afraid of flying than driving, but according to the NTSB, ony 706 passengers have died on American flights in this decade. We all too frequently gloss over the cost of human life when discussing the cost of infrastructure. If cities and metopolitan areas have the opportunity to devise systems of public transportation that allow more residents to commute to work via train/bus/light rail rather than driving, those opportunities should be taken advantage of. The cost in human life alone is too much to bear in order to say people should have the freedom to drive. More importantly, people should have freedom of choice in their means of transportation. In too many metropolitan areas in this country people are burdened with the necessity of a car. There are innumerable benefits to public transit, but the human benefit of lives saved or otherwise unaltered by severe injuries, should never be taken lightly. No transit method is ever free from danger, and that includes the simple act of walking. However, moving our populaces via mass transit rather than the individually controlled method of the automobile is sure to preserve the sanctity of life going forward. The more people are on larger systems and the less they must rely on cars the better off both individuals, families, businesses, communities and society will be. Whether you have lived in a city for years or are visiting one for the first time you probably prefer to take some sort of train when using public transportation. I believe this is due to the perceived superior reliability, safety and ease of use for trains. After all, trains are on tracks that only go in two directions and there are defined stops. Buses are just enormous cars that could go anywhere, even if they supposedly are supposed to go certain places. However, I think a lot of it has to do with maps. We are all used to the transit maps like that used in London. It’s a relatively abstract system of lines and colors showing where the various subway trains travel to and where they intersect with each other. Have you ever seen a bus map like that? I have not, but that does not mean they do not exist. Certainly such maps are easier when there is a guaranteed bus line such as bus rapid transit systems, like those in Las Vegas or Hartford. Systems that have dedicated lanes or demarcated lanes where buses go are much more analagous to light rail. This is even more true where bus stops have fare gates, such as certain places on Boston’s Silver Line. The Transportationist (see blogroll) has discussed improving bus signage to make buses more desirable. I believe this is critical. Buses are intimidating to the unitiated, becasue unless you’ve ridden one before or are intensely familiar with a neighborhood, where a bus goes and where it stops seem intensely mysterious. When you enter a subway station on the other hand you usually are shown at least a system map and many times shown a system map overlaid upon a geographic map. I cannot remember the last time I saw this at a bus stop. I recognize the difficulties of producing bus maps; the malleability of bus routes, fluctuation in stops, the lack of permanence of many stops, the challenge of portraying dozens of bus maps on one map. I agree that to portray every bus route on one map would be beyond chaotic. 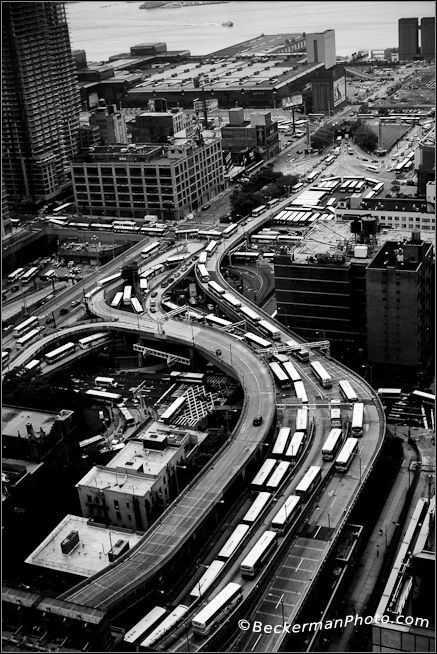 However, I believe urban transit systems could begin with their most heavily travelled lines. Maps should show where buses go, how frequently they travel, how frequently they stop (because if the bus stops every block or two blocks it is not necessary to portary every stop) and where the bus route intersects with other routes and other transit options. If buses travel on city routes it would also be potentially helpful if lines were painted on the street to show where buses travel. There is no doubt where trains go, just follow the tracks or the subway stops. However, it’s not always so clear for buses, especially, if there is no shed or covering at the stop. Therefore, better signage is required at stops to alert people where they in fact are. They should be visible from a distance, not small like no parking signs. Buses have a long history in this country of being portrayed as an undesirable means of transportation. In the first third of the 20th century General Motors bought out trolley systems across the country and replaced them with bus systems for the twofold reason that they could produce the buses and fewere people want to ride buses than trolleys and would therefore be more likely to drive. However insidious it was also insightful. Trains are more desirable than bus lines, but much can be done to improve bus lines such that they are more rider friendly. Visitors and residents to cities alike should see the bus system as a matter of access, not a burden less worthy of their patronage than rail.